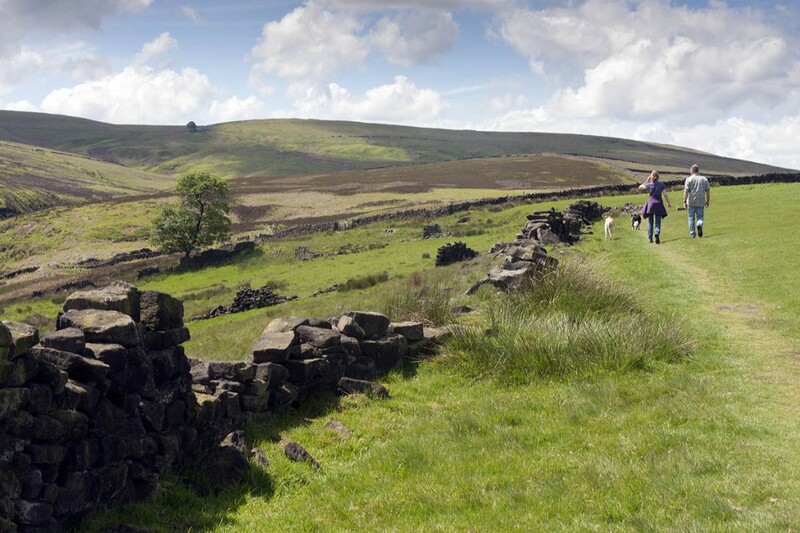 This walk follows a route on to the high moors of the Pennines, to a height of 423m (1,388ft). Weather can be unpredictable, cold, windy and, in winter, snowy and icy. Paths may be wet and muddy. Wear appropriate clothing and footwear and obtain a weather forecast. When low cloud or mist covers the hills, the ability to navigate in poor visibility will be required. A map and the ability to use it are recommended. Mapping and route information on this walk are available on our grough route system. To find the details for this walk, type WH1601 into the route search. (Points in brackets relate to points on the grough route track). Descriptions in italics indicate alternatives to the main route. The moors around the Pennine village of Haworth provided inspiration for the settlement’s most famous family, the literary Brontë sisters, and 200 years after the birth of the celebrated writers, latter-day visitors can still revel in the bleak beauty of the hills that provided the setting for novels such as Emily’s Wuthering Heights and Anne’s the Tenant of Wildfell Hall. 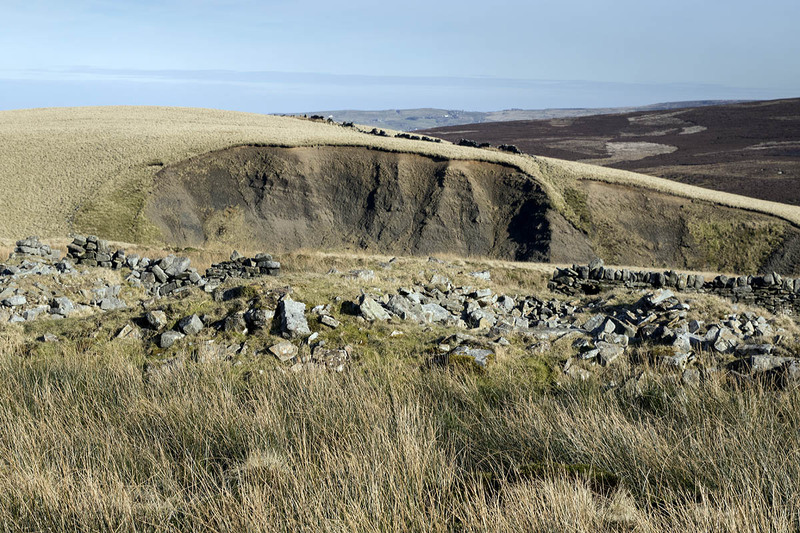 This walk takes the visitor to Top Withins, the ruined farmhouse which many believe to be the setting, if not the building, which inspired Emily’s best known book. Haworth is the starting point for the walk. 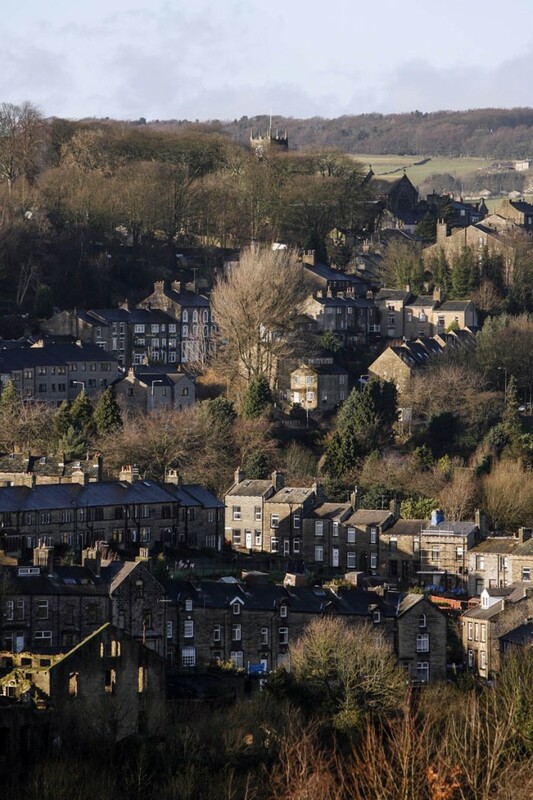 The village is served by buses from Keighley and Hebden Bridge and by the heritage Keighley & Worth Valley Railway, which connects to the main line at Keighley. The K&WVR runs steam trains at weekends and during school holidays, with some diesel-powered services at some other times. Pay and display parking is available on the Bradford Council-operated Parsonage Car Park and Brontë Village Car Park off Sun Street. There is also parking on the privately run Changegate car park. Note that underpayment and overstaying will attract a penalty charge. Some time-unlimited on-street parking is available on West Lane and Cemetery Road. Motorists who want to shorten the walk can leave their vehicle either on the parking areas of Penistone Hill Country Park or in the small area at the western end of Cemetery Road at the junction with Reservoir Road and start the route from there. Do not leave any valuables visible in your vehicle. The route begins on the steps of St Michael and All Angels Parish Church, next to the Black Bull pub. Head up the steps and turn left through the churchyard, passing the south entrance. The crowded graveyard, which contains an estimated 40,000 bodies, became a serious health hazard to the village, contaminating water supplies, and was closed to new burials in the mid-19th century. The Brontës’ home, the Parsonage, and the Old Schoolroom, can be seen to the West of the church. At the path junction, turn left and walk a few metres to a kissing gate. Pass through the gate and follow the path, with allotments to the left. Continue on the flagged path for 200m, to a track junction on the right (Point One). Turn right up this track Balcony Lane, signposted Top Withens, Brontë Falls, Brontë Way. The Japanese pictographs are testament to the popularity of the area with visitors from the Far East. Continue up the walled track for 250m, passing the settlement of Balcony on the right. The track meets Dimples Lane. Cross the road and continue slightly left on the path over Penistone Hill Country Park, signposted Brontë Way, Brontë Falls, Top Withins. The country park is a former quarrying and mining area, and there are many spoil heaps, discarded rocks and other evidence of its industrial past. The Forth Ponds, to the right of the path, are home to frogs and dragonflies at certain times of the year. The park is criss-crossed by many paths. Look out for Martin Heron’s Literary Landscapes sculptures – stone books partly buried in the ground – close to a path junction. Don’t take the crossing paths, but carry straight on, keeping the slight escarpment to the left. Further along is another carving on rock, by Stevan Tica, depicting industrial activities on the site. The path heads round to the left, passing more old quarry heaps. 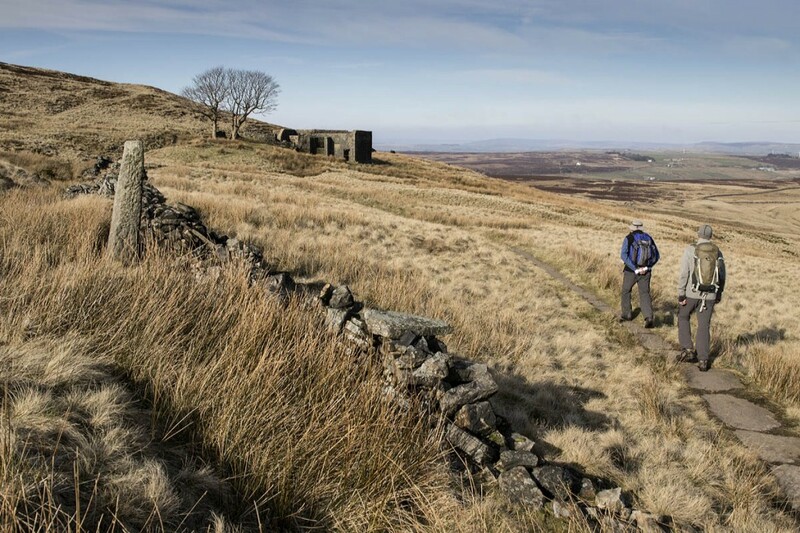 At a path junction marked by a finger post and a plaque erected by the Peak and Northern Footpaths Society, take the narrower path leading down to the right, muddy in parts, signposted Brontë Falls and Top Withins. The path meets Moorside Lane after 200m. Cross the road and continue on the path downhill for a short distance to a kissing gate at the side of a cattle grid (Point Two). Go through the gate and continue on the track, Enfield Side Road, passing Springs Farm on the right. The track, part of the Brontë Way, continues for 1.4km, passing the derelict and tumbledown Middle Intake Farm, before entering open country and then narrowing to a path. Continue along the path, which drops gently before meeting South Dean Beck at Brontë Bridge (Point Three). All around here is Brontë. There’s the Brontë Chair, a curiously shaped boulder that makes a handy resting place, and Brontë Bridge, a replacement clapper bridge for one that was destroyed by a flash flood in May 1989. 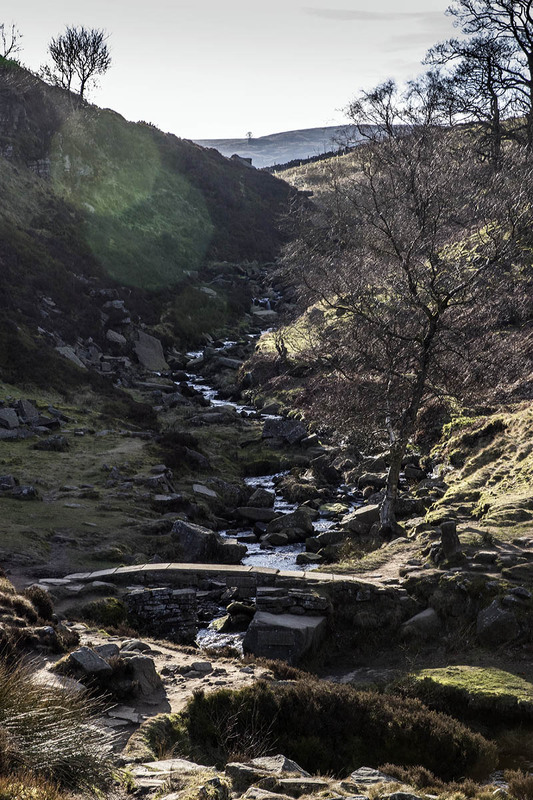 Brontë Waterfall, which comes down the gill to the South, seldom matches Charlotte’s description of ‘a perfect torrent racing over the rocks, white and beautiful’, unless preceded by heavy rain or melting snow. Don’t expect Niagara. In good weather, the area around Brontë Bridge is a popular site for picnickers and children paddling in the beck. Of course, in the sisters’ day, none of these sites carried the family name. The Brontës knew the area as ‘the Meeting of the Waters’. Cross the bridge and take one of the path routes that lead steeply up the facing hillside. The one to the left loops round with fewest boulders to tackle. Pass over a broken wall and then immediately through a kissing gate in the fence. At this point, the Ordnance Survey map is deficient, showing only the path and right of way leading diagonally up to the right, to the ruin of Virginia Farm. However, there is a clear path rising diagonally to the left, and signposted. Follow this diagonal path, flagged in parts, steeply up the north side of the valley, crossing broken walls, until it levels out, with a wall on the right. Carry on through the next field to a pinch stile. Go through the stile into more open country, with a broken wall on the left. In good visibility there is a fine view from here of Top Withins on the skyline. Follow the path forward and then slightly to the left and down, with the remains of Forks House on the left. Go through the kissing gate into Open Access Land, with a wall on the left. This is soon left and the path crosses level if, at times, muddy, moorland, dropping to an awkward boggy section in a little dip in a small gill that needs careful foot placement to avoid getting wet and muddy feet. The ground rises up beyond before levelling out again. To the right of this rise is the Cuckoo Stone, a small monolith that might or might not have archaeological significance. The path contours over the appropriately named Sandy Hill before dropping down slightly to where a path from Harbour Lodge joins from the left. Thin seams of coal can be seen outcropping in the peat banks on the left. The path levels out to the confluence of two small becks. Stepping stones are used to cross the right-hand stream. In periods following heavy rain, if the stepping stones are covered, the beck can be hopped across easily by heading to the right a few metres. The path then rises and Top Withins comes into view on the skyline. 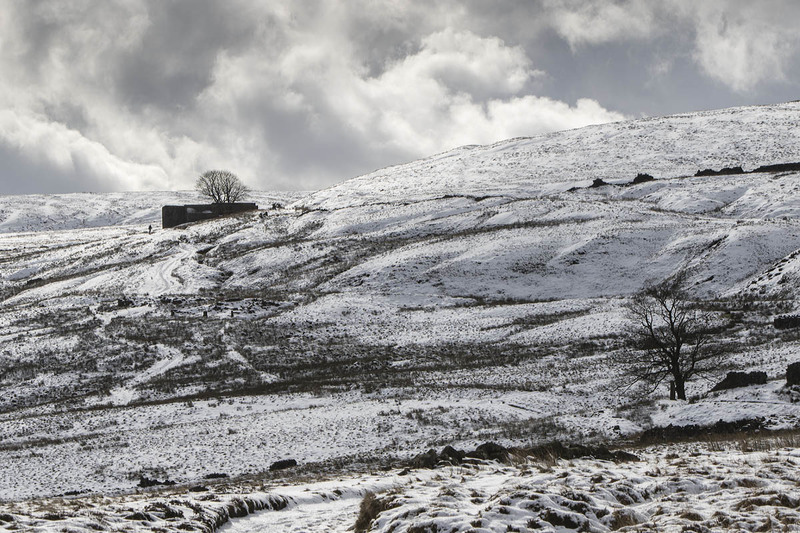 Although the OS map shows the right of way making a beeline for Top Withins here, the clear path climbs the hill a few metres to the right, to join the Pennine Way at the ruins of Withins, the middle of the three former farmhouses in this area. Withins and Lower Withins were razed many years ago, and little above their foundations remains, bar a few piles of stones. Turn left steeply up the Pennine Way until the path levels a little and Top Withins (Point Four) is reached. The ruins have little to commend them architecturally, and parts have been squared off and tidied up to try to arrest any further collapse. There’s a small bothy or rudimentary shelter on the north side of the building, which can be used to escape the wind and rain. There’s even a sleeping platform if you’ve brought your sleeping bag. The door sticks often and needs a firm push to open it. Remember to shut the door again if you use it. There are three or four benches outside Top Withins if you need to rest your legs after the ascent. The building when it stood intact bore little resemblance to Wuthering Heights, but its position does, emphasised by the fact that sketches in an early illustrated edition of the novel match the topography of the upper stretches of the valley and moorland around South Dean. On the inner wall of the southern elevation is an information panel detailing the building’s history. 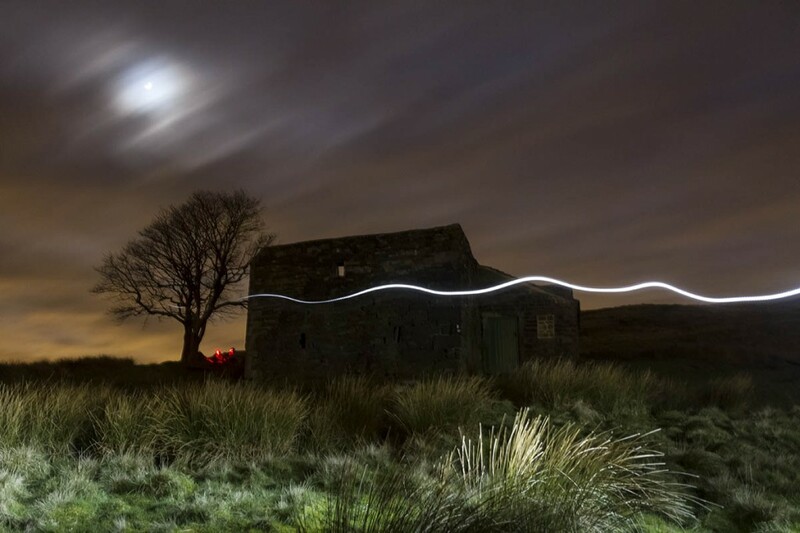 The former farmhouse lies on the Pennine Way, Britain’s first national trail, running for about 270 miles from Edale in the Peak District to Kirk Yetholm in the Scottish Borders. The name, sometimes spelt Withens, is thought by some to mean ‘willows’. 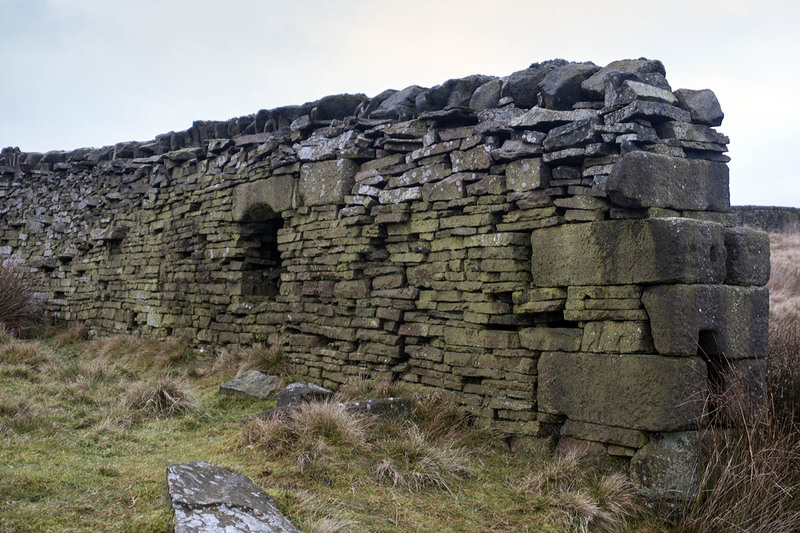 The window at the north-western corner of Top Withins, almost hidden in the rise of the hill, has ‘Dairy’ carved into its lintel, which has been proposed as an attempt to avoid window tax on it. The three Withins farms were occupied by families who would have combined dairy and sheep farming with textile weaving. The lower section of the building at Top Withins served as a barn, with the upper parts the living quarters for the farm’s occupiers. There is a pair of sycamore trees to the South of the ruins, with a bench conveniently placed to enjoy the view. And it’s the view that is the real inspiration for the Brontë mythology that has built around Top Withins. It is claimed there is no higher land at this latitude to the East until you reach the Ural Mountains in Russia. Don’t expect to spot them, even if you have brought your binoculars. Instead, enjoy the vista towards upper Wharfedale to the North, the rocky outcrop of Almscliff Crag near Harrogate to the North-East and the plumes of steam coming from the soon-to-be-decommissioned power stations of lower Airedale at Ferrybridge and Eggborough out to the East. Unless the cloud is down, of course. 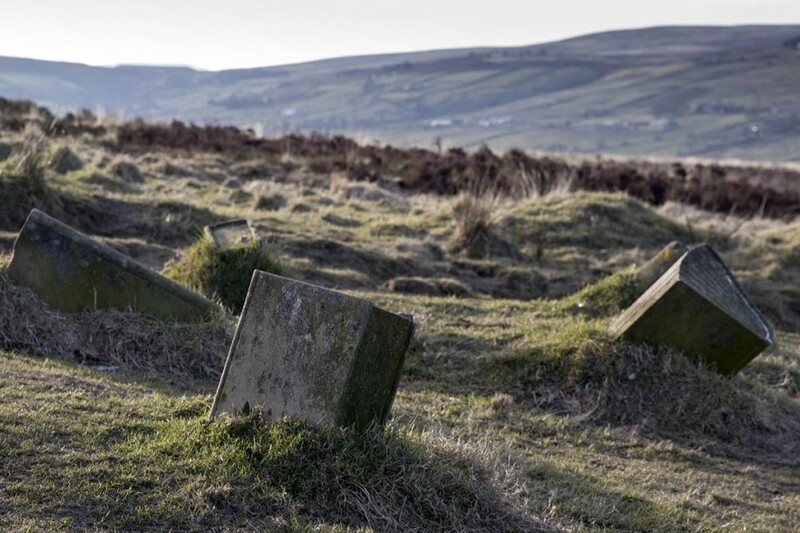 Having breathed in the spirit of the moors that inspired the literary sisters, and done your impression of Cathy or Heathcliff, it’s time to return to the village where the Brontës lived. If you’re short of time, simply reverse the route, making your way downhill via the sometimes slippery flagstones to the ruins of Withins (also known as Middle Withins) and then take the path to the right, retracing your steps. An alternative loop involves carrying straight on at Withins, continuing down the Pennine Way which turns into a double track, flagged as it passes over a boggy section of the moor. The track crosses a stream by a small bridge. This had to be repaired after a landslip following storms in recent years. The route rises slightly to the remains of a barn on the left, next to a tree. The recess where a sink was is still visible in the wall. A hundred metres or so further on, the ruins of Lower Withins can be seen on the right, and beyond them the large unstable escarpment of Scar Hill. The track dips a couple of times before continuing fairly level across Stanbury Moor. As the Pennine Way approaches Upper Heights Farm, to the left a view of Ponden opens up, with the reservoir and, upstream, the outcropped crag of Ponden Kirk, with another Wuthering Heights connection as the site of Penistone Crag. Accessible from the steep slopes either side of the Kirk is the ‘fairy cave’, a small gap that can be crawled through, though couples may want to think twice before making the trip, as myths abound of the consequences of death and suicide if the correct marital course is not followed. At Upper Heights Farm (Point Five), which was once used as an isolation hospital, take the right-hand track, heading towards a conifer plantation. An alternative return route is available here. 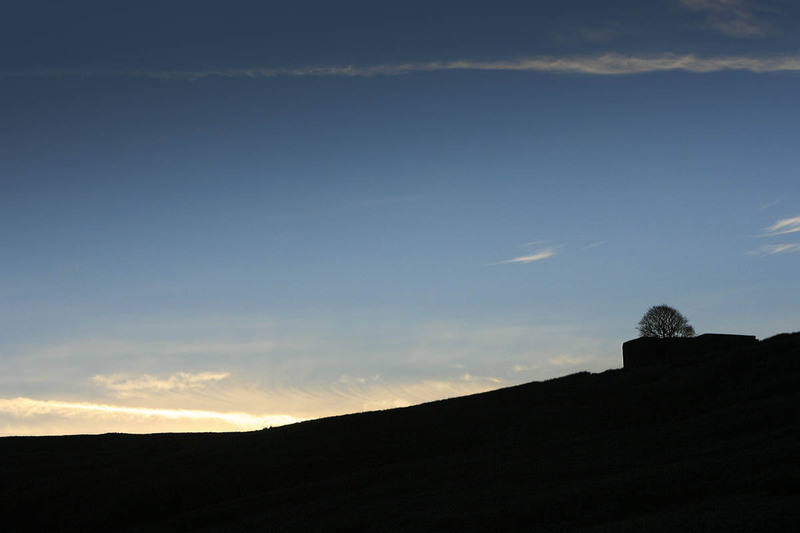 At Upper Heights Farm, take the left-hand track, continuing on the Pennine Way, passing Lower Heights. Continue down the track, ignoring the Pennine Way turn on the left, to the cattle grid. Continue straight on, down the track to Back Lane, a narrow surfaced road. The road from Buckley joins from the left, and 300m further, the main road at Stanbury is reached at the bus terminus triangle. At the time of writing, buses leave hourly Monday to Saturday until late afternoon, heading for Haworth. If you prefer to continue walking, head into the village of Stanbury, passing the village school on the right, then the Friendly and Wuthering Heights pubs on the left. Continue through the village to the end of the 20mph zone. Shortly after this turn right along Reservoir Road, dropping down to cross the dam of Lower Laithe Reservoir. At the far end of the dam, take the bridleway where it leaves the road on the left, next to the access road to the water treatment works. Follow the bridleway uphill for 700m until it meets Cemetery Road. Continue to the left, to the junction with Dimples Lane, then West Lane. Turn right on West Lane. After 50m look for a small kissing gate on the right. Go through this and head across the field to another gate. Pass through this along the path, with a sheltered housing estate on the left. Continue straight ahead to meet Church Street at the Brontë Parsonage Museum. On the main route, as you reach the far end of the plantation, turn right through a kissing gate next to a large gate, into a walled section, which is often boggy. This section of the route can be bypassed if very muddy by, rather than heading right through the kissing gate, continuing down the track for a further 150m. Then take the path to the right, at a finger post directing to Brontë Way, Haworth, Brontë Falls, to a stile which often has a muddy pool at its foot. Cross the ladder stile, then head on an indistinct path diagonally to the right to meet a kissing gate. Pass through this and head towards the tree at the ruins of another farm, Virginia. If you’ve followed the original route at the plantation, continue at the end of the walled section into open countryside, following an indistinct uneven track down the fall-line of the hill, to a finger post at the ruins of Virginia. Turn right along the path for just a few metres before taking the left-hand path steeply downhill, paved in part, to the kissing gate next to the finger post. This completes the loop. Go through the gate and carefully descend the rocky section to Brontë Bridge. Cross the bridge, turn left and retrace your steps to head back to Haworth. At the end of the track, beyond Springs Farm, where the track meets the road, an alternative route back to Haworth can be taken if preferred, rather than following the path diagonally right towards Penistone Hill. Otherwise, retrace your outward journey across Penistone Hill Country Park to Dimples Lane, Balcony Lane and the path through the churchyard. Head straight ahead along Cemetery Road, which runs along the lower edge of the country park, passing Hill Top on the left and then the cemetery on the right. This was created after the overcrowded churchyard in Haworth was closed to future burials. One of its early interments was that of Lily Cove, the ill fated balloon parachutist who perished when she became detached from her harness in June 1906 and fell to her death near Ponden Reservoir. She had been taking part in a display as part of Haworth Gala. Continue along Cemetery Road. Soon after its junction with Dimples Lane, it meets West Lane. Turn right, and after 50m look for a small kissing gate on the right. Go through this and head across the field to another gate. Pass through this along the path, with a sheltered housing estate on the left. Continue straight ahead to meet Church Street at the Brontë Parsonage Museum. Continue forward to the parish church side entrance and along the side of the church to the steps to the starting point of the walk. grough route enables subscribers to plot and share routes using Ordnance Survey mapping. An online manual is available here. To find this walk on grough route, search for WH1601, got to the start and right click on the route to load it. Great article and directions - best I've seen !